Knole House was originally a late 15th century fortified stone archbishop's palace, founded by Thomas Bourchier, Archbishop of Canterbury. Possibly built on the site of an earlier medieval fortified manor house that dated between 1281 and 1456. The two storey palace is said to have been an austere fortress-like courtyard house of two wards, with a Great Hall, a Great Chamber and a turreted gatehouse. In 1538, Thomas Cranmer, Archbishop of Canterbury was forced 'voluntarily' to give the palace to King Henry VIII. In 1543 to house the King's retinue, the Green Court, a two storey outer quadrangle flanked by a three storey gatehouse was added. In the early 17th century, Thomas Sackville, earl of Dorset, transformed the late medieval Royal Palace, into a Renaissance mansion. 3 miles east at Ivy Hatch is Ightham Mote and 8 miles south-west is Hever Castle. 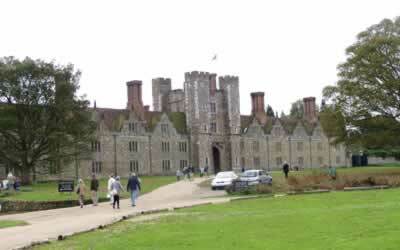 Knole House is located in Sevenoaks, off the High Street. 11 miles north of Royal Tunbridge Wells, on the A26-A225. The site is owned by The National Trust and the house is open, Tuesday to Sunday mid March to mid November 13:30-5:00pm, late November to mid December 11:00-4:00pm. The park is open daily to pedestrians, dawn to dusk.